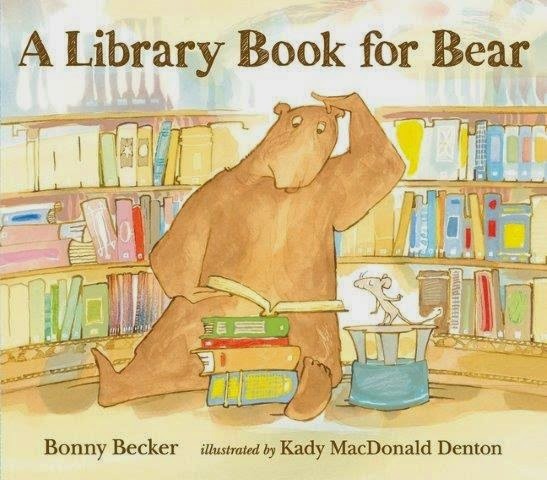 "Bear had never been to the library. He has seven very nice books at home..." And as far as bear was concerned, those were all the books he would ever need. Opening: "One morning, Bear heard a tap, tap, tapping on his door. When he opened the door, there was Mouse, small and gray and bright-eyed." Mouse is ready to go to the library, but now Bear is having second thoughts. He doesn't need any more books. What I love about this book: Mouse's insistence that there are "many delightful books in the library" - and his never-give-up attitude. Also his never-ending assistance in finding books for Bear. "Rocket ships! Ridiculous!" says Bear. "I am not interested in wooden canoes!" declares Bear. All Bear wants is to go back home.... until he hears the story lady reading a book about his very favorite thing: pickles. Look for the biggest book in the library. Then take your picture next to it. Travel somewhere exotic. Spin the globe and choose a country. Then find some travel books to check out for an armchair adventure. Hop on the computer and look for photos of the country you've chosen. Make a map of your "travels" and draw some "photos" to show what you did or where you went. Go to the cookbook section and find a new recipe. Then go to the store (and farmer's market), get the ingredients, and get cooking. Look through the books on plants and animals and learn to identify something new. Then go out and look for it. Find a book of Baby names and make a list of funny name combinations. Then adopt a new name for the day. Check out a book by an author you have never read before. Today we're joining PPBF (perfect picture book Friday), an event in which bloggers share great picture books at Susanna Leonard Hill's site. She keeps an ever-growing list of Perfect Picture Books. Review copy provided by publisher. 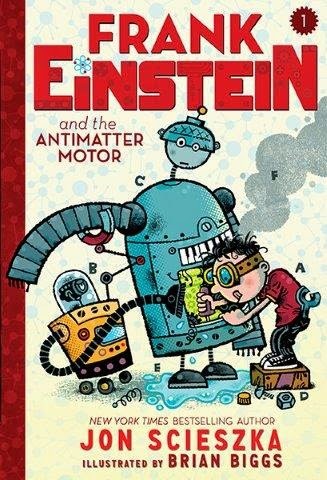 Frank Einstein loves figuring out how the world works by creating household contraptions that are part science, part imagination, and definitely unusual – at least that’s how the book jacket introduces this book. But Frank wants to build something grander than a toaster and more intricate than his Rube-Goldberg alarm clock. He’s busy building a robot that learns to learn – or, in the parlance of I. Robot, a robot with artificial intelligence. But one that still follows Asimov’s three rules of robotics. But what he really wants to do is build something awesome enough to win the Midville Science Prize and maybe save Grandpa’s Fix-It shop. With Klink and Klank (robots, not car guys) and a lot of work, Frank develops an antimatter motor. But evil-genius T. Edison steals the smartbots for his own nefarious purposes. If you know nothing about subatomic particle physics or Higgs-Boson, never fear. All you need to know is that this book is full of science fiction adventure that will keep you turning pages till the end. Even science fiction books have back matter. This one has Robot notes at the end and some bad robot jokes, plus some graph paper to sketch your own designs for smart bots – or whatever you plan to build for the school science fair. Today we're joining other bloggers at the Marvelous Middle Grade Monday Round-up over at Shannon Messenger's blog. Review copy provided by publisher. "The BIG annual Talent Show was just around the corner... and everyone was practicing." 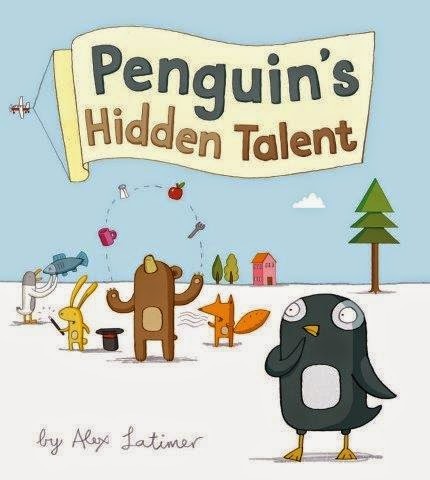 Everyone has a talent except Penguin... he can't bake or read a map or knit a sweater. Bear juggles, rabbit does magic tricks, and albatross can swallow humongous fish. What I love about this book: Penguin is a good sport. He tries many things... but they just don't suit him. So while his friends practice their acts for the show, Penguin helps organize the show. I also love the art. 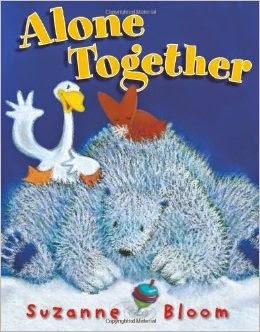 I love Penguin and Bear... how simple they are and yet how much expression is squeezed into their spare illustrated selves. This sort of art gives me hope that I might discover my hidden talent. Beyond the book: What sort of talents do you and your friends have? Can you juggle? Do card tricks? Dance on a tightrope? Build things out of blocks or recycled toilet paper tubes? Draw? Write poetry? Sing? If you're not sure, try a few things. Hint: if you've never tried to juggle before, don't start with toasters or tomatoes. If you have a pet, what sort of talents do they have? Can they do tricks? Locate lost items? Count to three? Put on a talent show. Gather a group of friends, and have some fun. Make some posters and invite people to enjoy the show. Does someone have the talent to make popcorn? Jasmine has just moved to Clover, Connecticut. She's going to a new school where she can start a new life - and she would rather go hungry than let anyone see her buy the reduced-price lunch. Or get off the bus at the trailer park. Maddie lives in a mansion and if she misses the bus it's no problem - dad will give her a ride to school. It's a brand new year and she really wants a chance to become a different person. So how do two very different girls end up being best friends? And then best enemies? And then best friends again? And what does Emily Dickinson have to do with it? 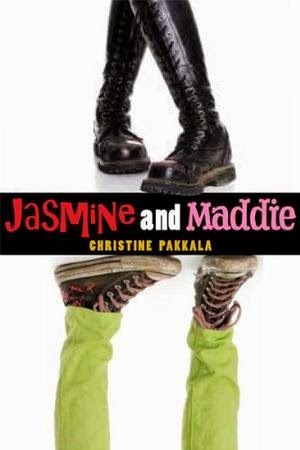 Author Christine Pakkala captures the voices of eighth-grade girls pitch-on... and really, one wonders: hasn't anything changed in the past (unreadable number) years? The girls deal with typical almost-teen problems: friendship, trust, popularity... and a bit of soul-searching. They keep journals and we get a deeper peek into their hearts through their poetry. Everything comes to a head when a ring that may-or-may-not have been willingly traded has to be rescued from a consignment shop. Another fun read from the author of the Last-but-not-least-Lola books. Today we're hanging out at the lockers of the cool MMGM kids over at Shannon Messenger's blog. Review copy provided by publisher. 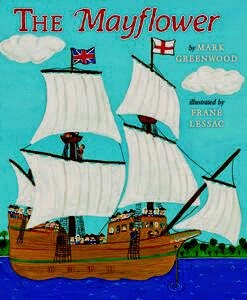 On September 6, 1620, one hundred and two passengers began their journey on the Mayflower. "The Pilgrims didn't know what to expect when they reached their destination," writes Greenwood. "Before them, only explorers and fishermen had undertaken such a dangerous voyage." This book is a straightforward telling of the voyage to a new world and answers important questions about what they ate and how they spent their time aboard ship. There's an exciting rescue at sea and a few tense moments when a main beam buckles and water pours in. What sets this book apart from other tales about the first Thanksgiving is the back matter. There's a timeline from 1620 to 1941, when President Franklin D. Roosevelt signed a bill to set aside the fourth Thursday in November as Thanksgiving. There's also a long list of books and other resources for curious future pilgrims. Review copy provided by publisher. Good thing I dug down to the bottom of my book basket because I unearthed this treasure. 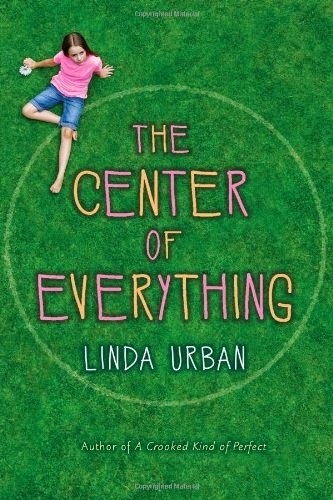 The Center of Everything is a fun read, best accompanied by a mug of hot cocoa and a glazed donut [in a pinch a fritter will do]. In the beginning, there was the donut. At first, the donut was without form - a shapeless blob of dough, fried in fat of one sort or another. We learn that the Ancient Greeks ate donuts, as did the Mayans and Vikings. And we meet Ruby Pepperdine - who is not eating a donut but is getting ready for the town's annual Bunning Day parade. Ruby is twelve. She has made a wish. And by the end of the day she hopes that her wish comes true, because she has really messed up. She's on the outs with her best friend Lucy, her just-becoming-friend Nero, and is buried under a whole lot of guilt about the last thing she did - or didn't do- for her grandma. There's even a bit of math tucked in with the sixth-grade drama. Ruby learns that donuts are actually tori (one torus, two tori). No equations, but a pretty good explanation about the donut shape. Ruby even tosses in a bit of wisdom about the theory of relativity. I don't want to spoil the ending except to say it's sweet. Today is Marvelous Middle-Grade Monday round-up. Drop byShannon's blog to see what other books are under review. Advance Reader's Copy provided by publisher. Sometimes, Bear likes to be alone. ... Fox is insatiably curious and wants to know why Bear is alone. Is he sad? mad? lonely? And would he mind terribly if Fox is alone with him? But Fox is .... Fox, and if Bear wanted some quiet alone time - well, let's just say that he should have found an empty page in another book. What I love about this book: the art. the silliness of it. the universal desire for some quiet space, and the just-as-universal tendency to impose on that quiet space. But most of all, the bond of love between the friends. A bit late for Day of the Dead, but still in keeping with the season.... this is a fun, snarky, satirical look at life - and life after death. Or, as the folks in Hell call it: death. That's the first question you'll be asked in Hell. Four years ago it was certainly the first question I was asked. Mitchell Johnson, seventeen years old, was hit by a bus. An inglorious end to his budding career as a rock star - or whatever he might have become. And that, he points out, is the problem: he never got a chance to live. If he could go back in time, he would change whatever it was that caused him to walk in front of that bus. 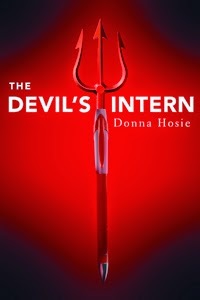 He would cheat death and live to be an old man.Instead, he's in Hell, and working as the Devil's intern - which is actually a pretty cushy job considering the alternatives. He could be working in the kitchens or on any of the other levels. Turns out, Hell is awash in bureaucratic red tape. And they are up to their knees in forms. Worst of all, the heating bills are breaking the budget and they are strapped for cash. Luckily the Devil has a credit card and a special arrangement with brokers on Wall Street: they get special privileges once they're dead in return for low-interest loans. When Mitchell learns there is a special watch-like device that will allow people to travel through time, he decides to revisit his death site and straighten things out. But he needs a buddy to go along, because using the viciseometer - that's what the time device is called - has side effects that might strand you somewhere you don't want to be. Instead of one buddy, though, Mitchell ends up traveling with three friends and all - er, things get complicated. Full disclosure: I liked the TV series "Dead like Me". I also like Gina Damico's trilogy about young reapers: Croak, Scorch, and Rogue. And the idea of civil servants buried in piles of paper work in the governmental offices of Hell tickles my funny bone. Review copy provided by publisher.